Graveyard Shift #4 by Jay Faerber and Fran Bueno is the epic conclusion to the exciting vampire miniseries. Hope and Liam are in the clutches of the head vampire, Cromeyer, and find out there's more at stake than they bargained for in his hidden lair. A four-issue miniseries is very short for an unestablished series. It means your story has to be economical in scope and efficient with the details to make sure it's fully formed right away. Faerber mostly succeeds as his leads, Liam and Hope, have good chemistry and a convincing love for one another. Since she was turned into a vampire Liam's been extremely understanding and committed to finding the people responsible. The conclusion is exciting with some clever twists but it occurs so quickly it's almost anti-climatic. Hope has to weigh her options about her new immortality as described to her by Cromeyer. She'll outlive Liam and has powers that make her superior to everyone else. Is it enough to convince her to embrace her new identity? It's not the only question as Cromeyer alludes to a cure, but it remains an open-ended detail that if Faerber and Bueno do another mini will be probably addressed then. Bueno continues to do incredible work especially when the vamps turn beastly. He seems to relish creating some gruesome monsters. He and Faerber make a good team and I look forward to seeing what else they got cooking. 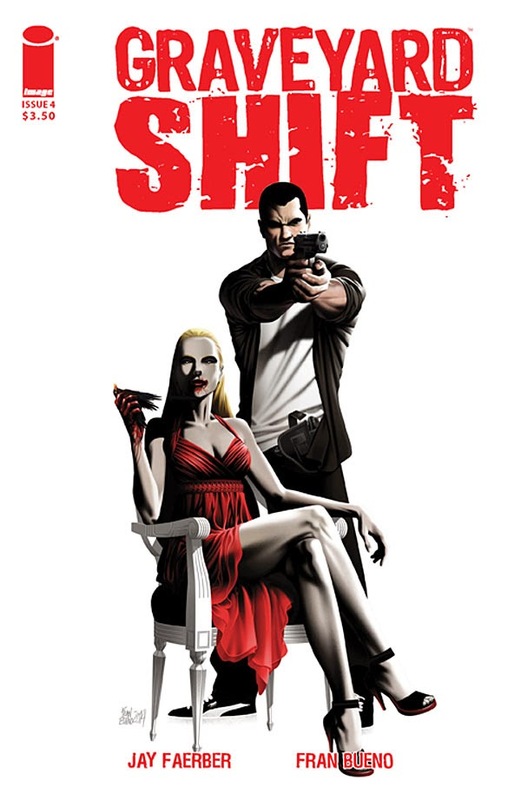 Overall, Graveyard Shift excels at bringing a fresh take on the vampire genre with characters that are smart and engaging. The miniseries is a good introduction to what really should be an on-going series to better flesh out the world-building. The conclusion may have been fleeting, but Faerber and Bueno have established a great foundation that will hopefully continue at some point.